Cherry Grove in North Myrtle Beach is unique on the Grand Strand for having homes that are facing the Intracoastal Waterway or its inlets on one side, and the ocean across the street or a few blocks away on the other side. Boating enthusiasts will LOVE living on the channels here, many having private docks with access to the Waterway and the ocean right outside the back door. In addition, there is a public boat ramp on 53rd Ave North, in the center of all the channels. The Cherry Grove Fishing Pier is close by for land-lubbers, and all the restaurants, shopping, and entertainment that North Myrtle Beach offers are just minutes up the road as well. If you are looking for a home on the water, this is as good as it gets. Rental income on these homes presents a good track record as well, with the biggest rental management companies handling many of them. Browse some of the samplings below to get an idea of the homes here, but you may find it easier to contact us with the specifics of what you're looking for and let us do the searching for you. 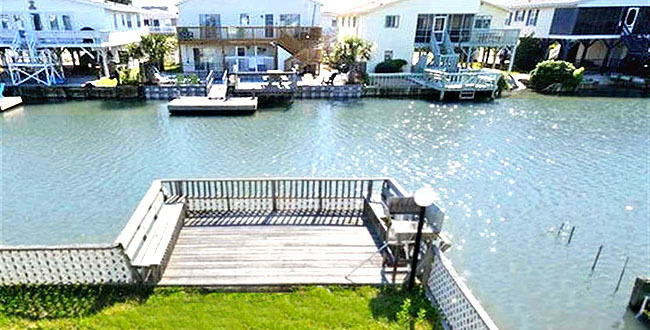 We'll be glad to help you find the perfect channel home in Cherry Grove. Give us a call or email!